Call them sweet. Call them sinful. Call them breakfast or dessert. However you tout them, doughnuts in Georgia are simply the best. These freshly fried dough rings are experiencing a revolution as culinarians push the boundaries of how a doughnut should taste. Varieties like maple bacon and key lime have been making headlines, while traditional glazed and jelly-filled remain menu staples. Whatever your flavor preference, be it classic or exploratory, you’ll find plenty to suit your taste buds at these 10 best doughnut shops in Georgia. Ray’s Donuts is what every doughnut store should strive for: variety, quality, originality, and fun, all wrapped together by great service. They’ve changed what a doughnut shop can become, offering all your favorite classics as well as flavors like maple bacon, crumb cake, and their tasty Sugar Ray’s. If you’re into fritters, this will become the only place you’ll ever go. You won’t feel like a zombie getting out of bed in the morning when you have these doughnuts to look forward to. Inventive flavors like Maple Toast Crunch, Fruity Pebbles, and lemon coconut have made appearances in their lineup. They also offer a build-your-own option so you can customize your doughnut experience: you choose the base, glaze, and toppings, and their master confection crafters do the rest. The team here has brought their fine dining culinary experience from NYC and put it to work crafting the most fabulous doughnuts you’ll ever taste. Creamsticks, jelly-filled, twists, or classic round doughnuts dance before your eyes, looking every bit as good as they taste. Each one is lovingly made from scratch to give you the best flavor and quality. Grab some in store or have them shipped directly to your door. This award-winning Atlanta metro favorite has five locations around the city, and is hands-down one of the best places you could ever be. Their bright display case makes it hard to choose just one or two doughnuts for your morning or snack routine. You’ll be hard-pressed to find a better doughnut or sweet treat anywhere in Atlanta. Fun, funky, and full of flavor, this doughnut shop offers a new experience every time you visit. As true doughnut and pastry innovators, you’ll find doughnuts of every color of the rainbow in flavors, shapes, and patterns you never knew existed. If you’re looking for the most creative doughnut shop in Georgia, this is your destination. Can a doughnut be healthy? Revolution Donuts is working hard to change the bad-for-you perception by using all-natural, organic ingredients, along with options for vegans and food sensitivity. They made every doughnut by hand from scratch to avoid using fillers and preservatives. Hands down, this is THE doughnut revolution we all deserve. Join the fun in Decatur or at their other location in Atlanta. There are three reasons why Sublime Doughnuts is tops in the industry: First, their doughnuts are an international experience that draws inspiration from across the globe and pack unique flavors and textures into every bite. Second, every doughnut is an artistic masterpiece that looks almost too good to eat (almost). And third, they’re open 24 hours a day, so there’s never a bad time to enjoy a fresh doughnut. You’ve never experienced anything quite like Sublime Doughnuts. This family-owned doughnut shop lovingly crafts their confections by hand and makes them fresh daily. 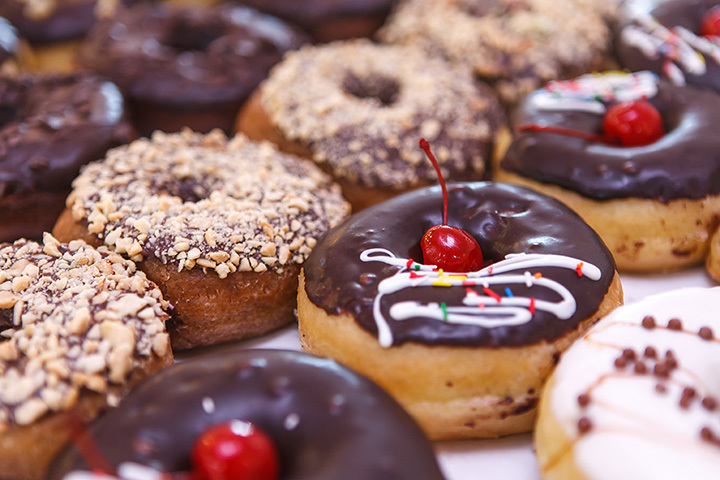 Serving the best of cake and yeast doughnuts, you’ve got your pick of over two dozen different flavors. They’re amazing in every way, and you’ll readily agree once you sink your teeth into one. There’s only one reason you need to prioritize a trip here: their signature red velvet cake doughnut. Lathered in cream cheese frosting, this doughnut is five-star quality at a two-star price. They have plenty of other delicious flavors if red velvet isn’t your thing, but it looks so good it will be hard not to give it a try. A local’s favorite, no-frills shop, their doughnuts have become somewhat of an icon in this community. The word “best” is in their name for a reason: grocery stores and doughnut chains have nothing on this amazing little sweet shop. Folks here can’t resist them, and you’ll see why when you try one for yourself.